Shear reversible gel developed through sol-gel route shows a drastic change in viscosity upto 7 order of magnitude on shearing. Because of its unique behaviour it is quite suitable ink material for direct writing thus have potential application in making electronic, optoelectronic and solar devices. 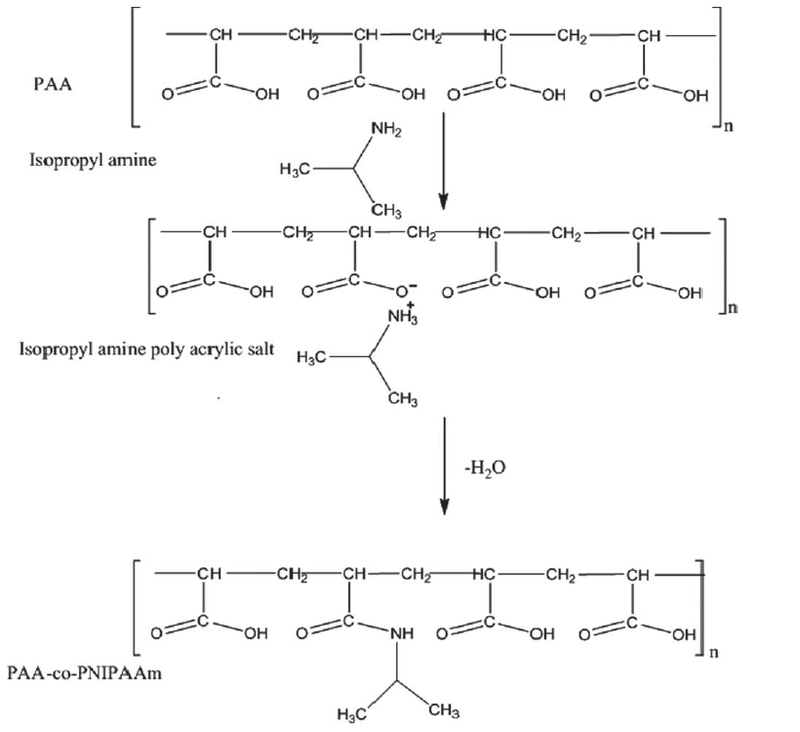 A series of copolymers of poly (AA-co-NIPAAm) were synthesized by a novel route, employing solid state condensation of polyacrylic acid and isopropyl amine in different feed ratios (44 mol %–100 mol % AA). The structure of the copolymers was characterized by FT-IR, 1H-NMR. The lower critical solution temperature (LCST) was found to vary with the copolymer composition. Silica nanoparticles modified using glycidoxy propyl trimethoxy propyl silane were reacted with the responsive copolymer to form responsive core-shell particles. Janus particles are anisotropic, multi- functional particles. The name Janus particle was given on the name of Roman God Janus, the God of gates, having two opposite and distinct faces. The Janus particles have two or more than two functionalities which can be used to impart two different properties to the particles, where one of the functionality can be used for attachment with the substrate and the other one for imparting specific properties. The Janus particles show certain unique properties as amphiphilic, magnetic, optical, catalytic, electrical as well as their characteristic self- assembly. Janus particles can be synthesized having one side covered with nanoparticles. These Janus particles can be applied to different textile substrates in order to attain different functionalities like anti-microbial activity, self- cleaning, hydrophilicity and hydrophobicity etc. Silica nanoparticles of diameter nearly 500 nm have been synthesized by Stöber method and functionalized with multiple functional groups suitable for textile applications. Scanning electron microscopy (SEM) analysis confirms the highly monodispersed nature of silica nanoparticles. Ag-SiO2 Janus particles with functionalities suitable for textiles have been prepared by synthesizing silver nanoparticles on half of the surface of silica nanoparticles by chemical reduction method. SEM analysis shows the formation of these Janus particles.